2005_ ADI Design Index, selects for Compasso d’Oro 2007, Electric broom Flexica (Imetec), Milan. 2005_ The International Design YearBook by Marcel Wanders selects the Dandelion lamp. 2004_ New Generation Camera award for JVC, Japan. 2003_ I.D. AWARD for Pulse project, New York. 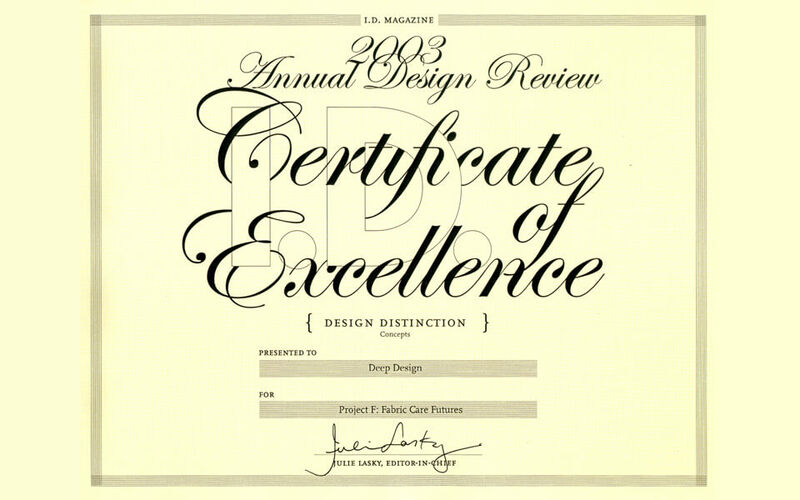 2002_ Selected in International Design Encyclopedia of MOMA, New York. 2002_ Pulse Project on the Book of Observatory on Design and Fashion, Premiere Vision, Paris. 2001_ Young & Design Prize, for “Tenso” (DNA), Salone del Mobile, Milan. 2000_ Designer for the third millenium, TV programme “Lezioni di design”, 50° episode, Rai Tre. 1999_ Young & Design Prize, for Steel Collection (Mandarina Duck), Salone del Mobile, Milan. 1998_ Young & Design, for the Treperdue (prototype), Salone del Mobile, Milan. 1997_ Special mention at Esaedro Competition, Koln Fair (Germany) for Roller Chair project. 1996_ Special mention for ecological packaging project for cosmetics, 3°Cosmopack, Bologna. 1995_ Special Prize Tiziana Mascheroni for a pliable chair in carbon fiber. 1995_ Prize for an ecological packaging project for soap, 3°Cosmopack International Prize, Bologna.